KENILWORTH – A bright red bench will adorn the Kenilworth Public School playground to help kids see they are never alone. 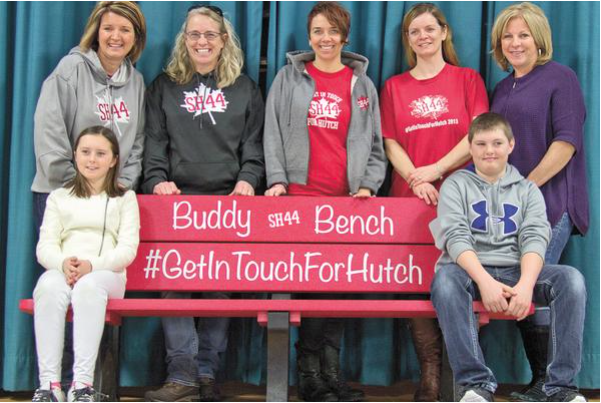 Myrna Hutchison of the Get in Touch for Hutch group presented the school with its “Buddy bench” on Jan. 29. Hutchison referenced the Disney Pixar movie Inside Out to explain emotions and that it is okay to feel sadness and fear. A child can sit on the bench when they feel sad or lonely and other kids will see that and try to include him/her. Hutchison added the bench is to encourage communication and awareness as well as inclusion. She said she wants to show kids they are never alone. This is the third bench the group has installed in Wellington County. St. John Catholic School in Arthur and Salem Public School already had benches and Minto-Clifford Public School also received a bench on Jan. 29. Arthur Public School and St. Joseph’s Catholic School in Fergus are slated to get a bench soon. Hutchison, who wants every school in the county to have a bench, noted some schools already have their own variation of the buddy bench. Sonya McNabb, parent council member at Kenilworth Public School, said she is excited about the project. Noting the school is small, she said she thinks the kids will use the bench often.